I came across David O’Brien’s work earlier this year at a small gathering of local artists and writers in Santa Fe. O’Brien’s piece, an image of dry, cracked earth in a palette of pink and blue, struck me immediately with its ambiguity. 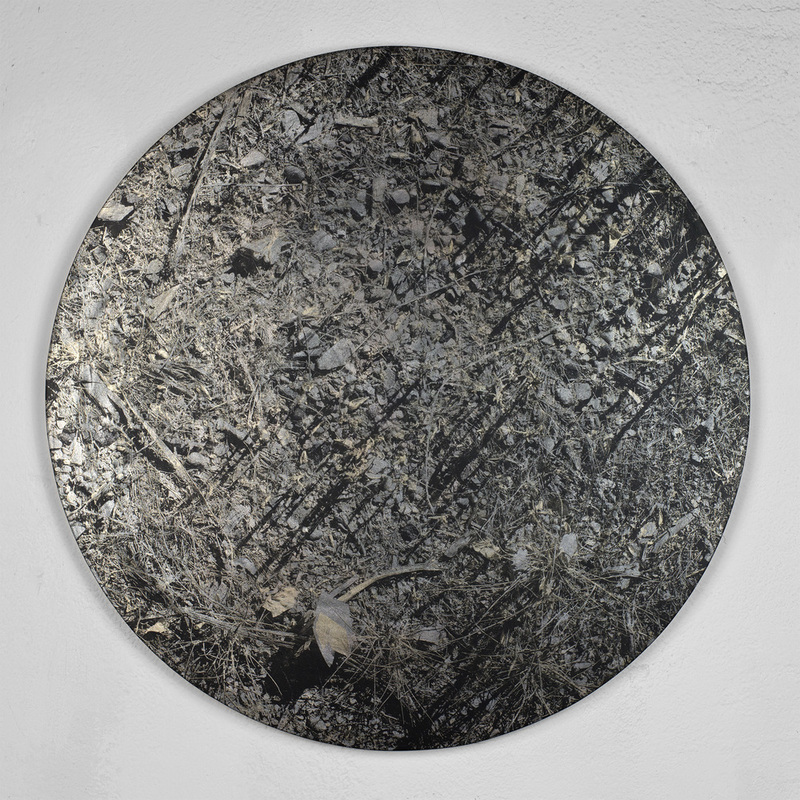 Hovering between lunarscape and desert landscape, photograph and painting, the image is one of an ongoing series of “disc paintings” in which O’Brien evidences human activity by documenting material left behind. A photographer who seeks out alternatives to traditional photographic printing techniques, O’Brien is currently investigating screen printing as a method for transferring these images. It’s an incredibly intensive process of deconstructing an image and slowly reconstructing it, layer by layer. To transfer a single photographic image, as many as four screens and up to twelve layers of paint are required, and each must be carefully prepared, cured, burned with a photographic image, and rinsed before color can be pulled through. Here, O’Brien shares more about his process, the evolution of his work, and his solo show at Santa Fe’s Center for Contemporary Art, which opens January 22, 2015. How did you begin working with silk screen printing as a medium? Was there an “ah-hah” moment? Before, I was doing big collages of people. I spent two or three years photographing everyone I knew and then collaging them into big clouds. I got to the end of that project and was looking for what the next project would be, so I would go out and just photograph things randomly. I was out in the Mojave Desert in this place called Vasquez Rocks, and I started looking at the ground and seeing all of these footprints. I looked up and saw a sign, and I realized I had found a piece of the Pacific Crest Trail. I started photographing the ground and all of these footprints. It was like a weird inversion of the photo swarms of people, where the footprints were evidence of people in the landscape. And somehow, at that moment, I thought that these photographs would make good silk screens, because it was just purely light and shadow. Is that something you had worked with in the past? No. I’d never done a silk screen before, ever. I’m always looking for ways to get away from traditional photography, and I’d been thinking about other ways to print things. I really like working with my hands, so I somehow gravitated to this process. So then you ran with this concept and started photographing specific places? Well, there’s one thing that happened between those swarms of people and [my current work]. I did a residency in Iceland, and I planned to keep photographing people there, but I couldn’t figure out how to get all of the equipment on the plane in any sort of reasonable way. So, I had to abandon that, and I went there with just a camera and a computer. If you go to Iceland, you inevitably start seeing all of the crazy large-scale evidence of climate change. I started doing these performative video projects where I would be dismantling the Arctic in a sort of satirical way [by] dragging bits of ice around, basically pulling them out of the frame of the video. That got me thinking about all of the weird ways you can think about climate change, not in an activist sense, but maybe in a slightly humorous or satirical way. There’s comedy in tragedy. There’s a fine line there. I had never seen anyone approach climate change in that way, so I was thinking about how to do that. The footprint photos came from [that phase], and then evolved into documenting those sites as evidence of people being on the earth and dropping things on the ground. I’ve been reading more about object-oriented ontology and new materialism and trying to think about it from the material’s perspective – what it’s like for highly synthesized, engineered materials to be asked to go back to the earth that they came from and reintegrate in a way. It’s almost like taking a person out of their native country, waiting a few generations, and asking their grandchildren to go back and try to reassimilate somehow. To me, there’s this chemical struggle, this material struggle on the ground everywhere, with these materials trying to reassimilate to the earth. How do you choose a location? Is it purely at random? Everybody has some sort of sensibility, visually. For one reason or another, I am drawn to certain collections of things on the ground, and I’ll take a picture. For the show at the CCA, some of the photos are of trash that’s scattered along the banks of the Colorado River in Needles, California. That speaks, in a multiple times removed kind of way, to how much people rely on that river in the West for all of civilization, really. There will also be a video projection from Iceland of a river that’s all glacial melt water. There’s this rock outcropping in the middle of the river, and [I was] thinking about the extra pressure that's added to the rock from the increased melt water due to human industry, and giving some agency to materials that way. What is the significance of titling each photograph with its exact geographical coordinates? It draws it into the language of a scientific specimen or an archaeological site. This is a DIY kind of archaeology – I can investigate these tiny patches of ground and then return to those sites. Geolocating helps me know how to get back to them. I also think it’s interesting that someone looking at the work could go to Google Earth and punch in those coordinates and zoom way down to get pretty close to that spot. Have you always been drawn to collections or groups of things? I think I have. In architecture school, we studied old cosmological diagrams from the Renaissance. I spent a lot of time studying Vitruvius and Palladio, and the buildings themselves were cosmological diagrams, which is to say a picture of what you thought the whole universe was or a way to diagram everything. There’s the famous Vitruvian Man – that’s a kind of cosmological diagram in a way – trying to measure the human body against these absolute forms that are present everywhere in the universe. Ever since then, I think I have been trying to make that. These photographs are collections of little things, but they’re also simple ways of trying to get ahold of (or get a picture of) what the world is, in a super general sense. How does your work function for you on a personal level, beyond any symbolism or conceptual meaning? It’s kind of like a compulsion. It’s just a thing I have to do. It’s a way of working through things, of thinking through issues. I feel like I’ve told this story a few times, but you know how when you’re going hiking, and you’re in this perfect moment in nature when everything starts to come together and make sense, and then you round a corner on a trail and you find a styrofoam cup, and the whole thing is shattered for you? These paintings are a way of making sense of that, trying to come to terms with it, and maybe even finding something interesting or poetic about it – acknowledging that this is the world that we've got. It's not that I'm okay with environmental destruction, but we can't deny that the system of consumption and destruction is a fundamental part of human nature and therefore nature as a whole. Oddly enough, now when I turn the corner and see that piece of trash on the ground, I kind of get excited by it – like, oh, you're still there! How do hope your work functions for other people? I want it to start conversations. I’m continually trying to make my work better in the hopes that it can speak to people in a way that may alter their perception of the world around them. Maybe they’ll look at the ground or look at things a little differently. I think that’s the best that any artist can hope for. I like work that tells you something different when you go back to it a second time, or each time you look at it, you see something you didn’t see before. At MOCA LA, I went on a tour led by the artist Sterling Ruby and he kept saying, “This one I really love, but I wouldn’t want to live with this piece. It’s just too much. But this one I wish I could take home with me and live with.” That really stuck with me, and I’m thinking about work that you can live with that changes a little bit every time you look at it. Be sure to catch David O’Brien’s solo exhibition, opening January 22, 2015 at the Center for Contemporary Art in Santa Fe. Check out his website, www.davidobrien.com, to view more of his work.